The text of Basta vincesti is taken from Act 2, scene 4 of Metastasio’s Didone abbandonata. Dido, Queen of Carthage, has been rejected by her beloved Aeneas. Seeking to provoke a reaction from him she has signed a document accepting the marriage proposal of Jarba, King of the Moors, and the jealous Aeneas has duly demanded that she retract this acceptance. As she succumbs to her true feelings and hands the document over for Aeneas to destroy, she begs him to remain faithful and not to abandon her. 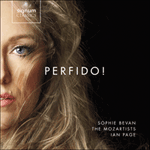 Her anguished anxiety, insecurity and tenderness are beautifully captured by the plaintive yearning of the melodic line and the burnished orchestral texture, featuring flutes, bassoons and muted violins. Didone: Basta, vincesti, eccoti il foglio. Vedi quanto t’adoro ancora, ingrato. Mi togli ogni difesa e mi disarmi. Ed hai cor di tradirmi? E puoi lasciarmi? Dido: Enough! You have won. Here, take the letter. See how much I still adore you, ungrateful one! you the heart to betray me? And can you leave me?